What do you do with adversity? I laugh at it. For three decades under the stage name, Chris “Crazy Legs” Fonseca, I have had the thrill of sharing laughter with audiences. I was born with Cerebral Palsy, due to my mother dying during my birth, so my path has never been an easy one. Being adopted by an elderly uncle and aunt (my mother’s sister) who spoke broken English at best made the climb a bit steeper. My family is of Mexican descent. Add in the rural setting of Fort Morgan, Colorado, a small farming community, and success in entertainment was far from a realistic goal. I began doing comedy as a sophomore in college and was soon hitting open mics all around Colorado. After a very successful college journalism career, which included a Collegiate Journalist of the Year award, I did the logical thing. I started a comedy career. Quickly moving up in the comedy circles, I began touring in 1987, and in the ’90s, I began making appearances on cable TV shows, then hit late night. I was a guest on The Arsenio Hall Show and The Late Show with David Letterman, and performed at the prestigious Montreal International Comedy Festival and the American Comedy Awards on ABC. Oddly enough I even appeared on the hit series, Baywatch. They had me riding a customized, motorized wheelchair on the beach, which was great. But they also had me out in the water on a Boogie Board. Considering I don’t swim, it was quite an adventure. I was supposed to look like I was having fun, and I guess that’s where I did the real acting. In March of that year, I was involved in a car accident, which required surgery and months of physical rehab. I hit the road again in a wheelchair. I formerly used a chair as a kid, worked my way to a walker, then ditched the walker as a freshman in high school. The mobility device often misleads people to believe Cerebral Palsy is a mental condition. In my case, ordering at a restaurant can become a task when waitstaff pre-determines I can’t order for myself. At that point, one of my five children would gladly intervene and order Dad the thing he hates most on the menu. I have done numerous benefits alongside such luminaries as President Jimmy Carter, Amy Grant, and more. 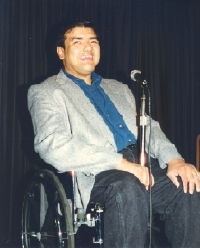 As a person with a disability, I have received recognition from many places. I got to perform at the Kennedy Center for President George Bush Sr. and George W. Bush for the 15th anniversary of The American with Disabilities Act. I was given an award from The National Association for Speech Disorders, and I was an ambassador for World Cerebral Palsy Day in 2012. It’s an honor to have recently been elected to the Colorado Arts and Entertainment Hall of Fame. I am very close to my children and live in Colorado Springs, Colorado. I’m an avid San Antonio Spurs and Denver Broncos fan. I know it’s unusual to see a handicapped person up onstage, and if I do well, the crowd may get something out of it besides the laugh. But I’m not out there on any kind of a mission to promote disabled people and demonstrate what they can or can’t do. I’m a comedian, and I’m just trying to be funny.